My Easter centerpiece is set. 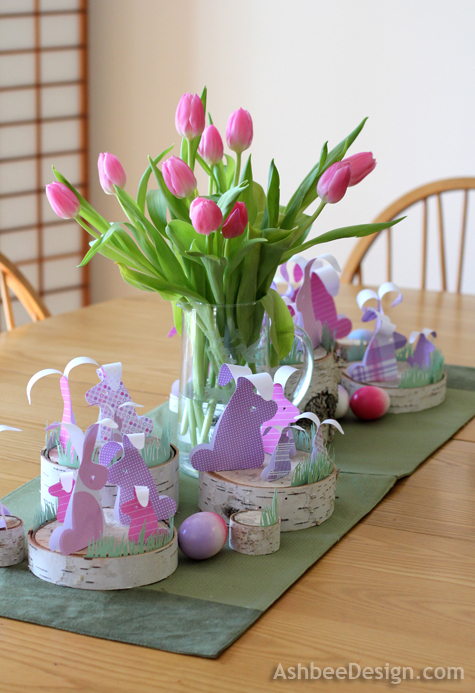 I combined several earlier crafts together to make this arrangement. I generally have two different centerpieces for each holiday that has a big family dinner. There is the centerpiece that is on my table for the weeks leading up to it, and an entirely different one for the holiday meal. That is because of space. I need space for the mountains of food at the meal. Yet the table is big and empty for the weeks before. This is my tablescape for the weeks before. It fills the space but leaves an end where my husband and I have dinner each evening. If I host Easter this year (as yet undecided) I'll rearrange things for the dinner. 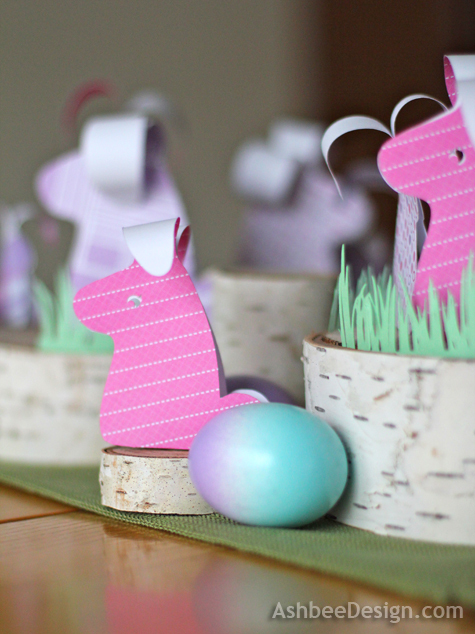 This grouping combines my paper bunnies with my ombré egg craft projects. I used the white birch stands from my winterscape and made some added grass out of paper. To that I added tulips because springtime isn't coming fast enough for me! The paper grass easily slid right into the space created by the bark separating from the tree in the birch tree slices I harvested from a downed birch tree. 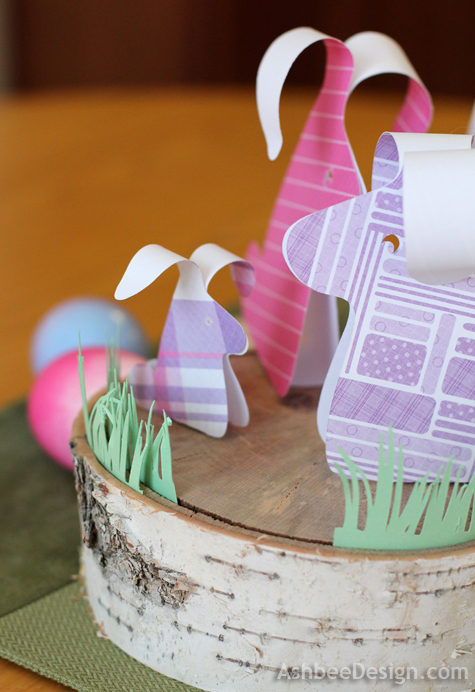 The tutorial for creating these cute bunnies is here. They are quick and easy and, although I made mine with a Silhouette Cameo, they can easily be made with good old fashioned scissors as well. I created a Silhouette file for the grass as well and printed up several lines of grass in spring green card stock. I took advantage of places in the birch slices that had double splits and added two layers of grass giving a nice depth to the arrangement. I also scattered some of the ombré Easter Eggs I painted last year around the base. The tutorial for making the eggs is here. The whole arrangement adds some much needed spring color to our home. Thanks for visiting and commenting. I am especially liking my bunnies today - we just got 12" of SNOW!!!! What cute bunnies. Great ideas. Thank you. Quick and easy. Try some. Your table is darling! 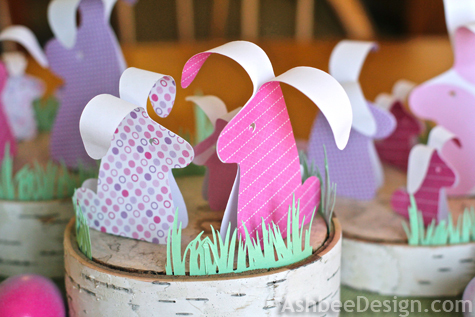 I love those sweet sweet bunnies! Wish the grandkids were coming here for Easter. I bet they would enjoy them as well. This is seriously just too cute! Adorable! Stopping by from the TT&J link up.. Hope you're having a wonderful evening! Thanks for visiting and commenting. I had also tried purple tulips put the pink ones made all the difference. Of course flowers in the springtime just bring smiles into the house! Thanks Christine! Need to finish decorating here, although it is time to move on. When blogging you need to be about 4 weeks ahead of the season!